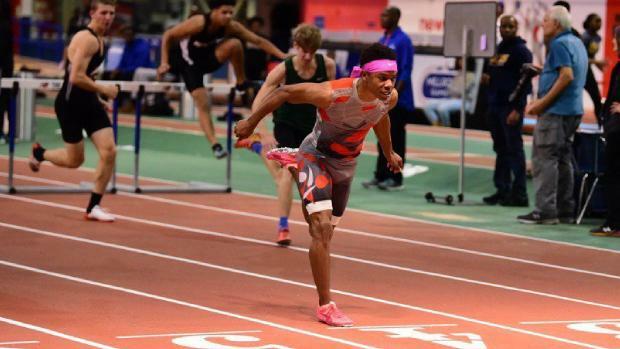 One of the best stories coming out of the New York met area this indoor season has been the development of Jessie Parson, a junior at New Rochelle High School. Parson has recently begun to make a name for himself on the New York State and even the national level with a series of top performances. This past weekend, Jessie Parson was a very busy young man. On Saturday, he competed in the Bullis Champion Speed Invitational at the New Balance Armory Track and Field Center in Manhattan. There he set personal bests, running 6.98 seconds for second in the 60-meter dash, then added fourths in the 55-meter hurdles, running 7.37, and 7.95 over the 60-meter distance. 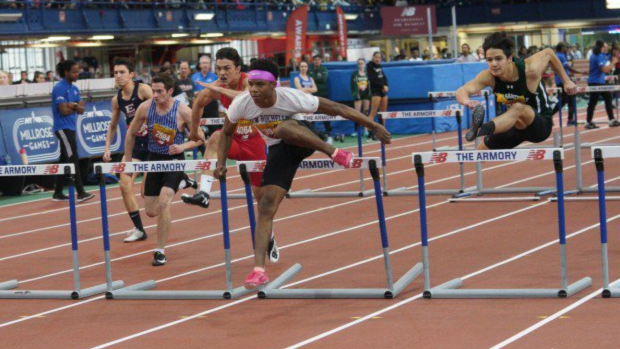 Back again at the Armory on Sunday for the Westchester County Championship meet, Parson again showed his talents, winning the hurdles (7.63), and placing second in the 55 (6.51) and the 300 (35.36). With a series of stunning outings this indoor season, Parson is making the track world sit up and pay real attention. He's also beginning to add to a proud track and field tradition at New Rochelle. Track and field has been a championship-caliber sport at New Rochelle for many decades. Lou Jones was a world-record holder at 400 meters (45.2), a gold medalist in the 4x400-meter relay at the Melbourne Olympics in 1956, and a double Pan-American Games champion at 400 meters and the long relay in 1955 at Mexico City. More recently, the women's hurdles have come into the spotlight, with Ayo Atterberry and Shenae Dawkins among the standouts. Then came three straight years of individual State 55HH Titles for Ashley Wiggins and Victoria Jones-Alleyne in 2013-15. And don't forget sprinter Lynn Layne, the state's best more than a decade ago. And a legendary New Rochelle track coach, Joe Soprano, was a star middle-distance runner at Manhattan College in the 1950s. Now Parson appears ready to add to the great tradition. Boys Head Coach Joe Intervallo, now in his eighth year at New Rochelle, has high praise for Parson, saying, "Jessie takes a professional attitude toward the sport. He has that knack- you don't have to tell him much. He already knows what to do- he knows about warming up correctly, stretching, motivation, and getting ready for his races." Part of that may come from Parson's long involvement with track and field. Growing up in suburban Maryland, midway between Baltimore and Washington D.C., Parson started competing at age seven, and at age ten, he was trying the hurdles. By the time he was a high school freshman at Reservoir High School in Fulton, he was already an accomplished club athlete, having competed in national Junior Olympics and USATF age-group competition as a member of the I5Elite Track Club. As a freshman, he clocked 6.58 for 55-meters, and made the finals in the Maryland State championship. "I would have done more, but I got hurt in the finals," he said. Transferring into New Rochelle at the start of his sophomore season, Intervallo knew that he had a budding star. 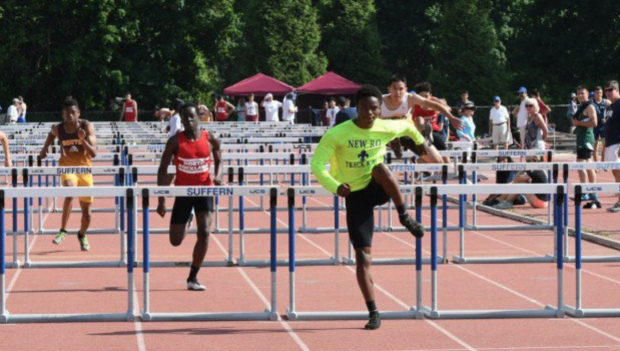 "When the typical kid comes out for the hurdles, they kind of high jump them at the start. Jesse already had his technique and knew his craft." Practices with Parson are give-and-take affairs, with Intervallo and the junior star exchanging ideas. "We go on a hard-easy day," said Intervallo. "On the hard days- the specifics we can work out." Indoor practice takes place twice a week at the Armory, and alternates between outdoor workouts and school hallways, depending on the weather. Parson lifts weights twice a week, and does plenty for stretching. Learning more about the sport is important, and he watches youtube videos of some of the hurdling greats, favoring US Olympian David Oliver. Intervallo takes a long-term approach toward Parson's future. "Obviously, we'd like to see him get records and such, but he's so talented that we have to use him in a variety of events. When he gets to college, he can specialize." The coach added, "The other day, Jessie had to go right to the dash after the hurdles. That holds him back a bit." That doesn't seem to faze Parson, who said, "I 've been doing this (doubling and tripling) for so long- I'm used to it." But after the work load this past weekend, Parson admitted, "I took a day off on Monday." The immediate goal, says Intervallo, is "to get a Sectional title, qualify for the New York State meet, and do well." Parson will have some tough decisions to make concerning his college future, as college coaches have started to take notice. He's also a much-improved football player, starring at defensive back, and with his speed, an offensive threat as well. At five feet, 10 inches, and 155 lbs., is he too small for big-time college football? Soft-spoken, yet exuding a quiet confidence, Parson has set his goals high, and says, "I 'd like to play both. I think I can." He's almost unaware of the great New Rochelle track tradition, saying, "I don't know all the school records and the people who came before me." The next six weeks are loaded with championship competition, yet Parson has his sights set on long-term improvement. He's set some goals for himself (6.30-55, 7.20- 55-HH, 21-low for 200, and 34 in the 300), but quickly adds, "The school records and such don't mean that much. I want to be the best I can be, and keep moving on."